1 of 6 Heat oven to 350 degrees F. Grease and flour a removable-bottom tube pan, or have two 7-7/8 x 2-3/8-inch paper tube pans ready. 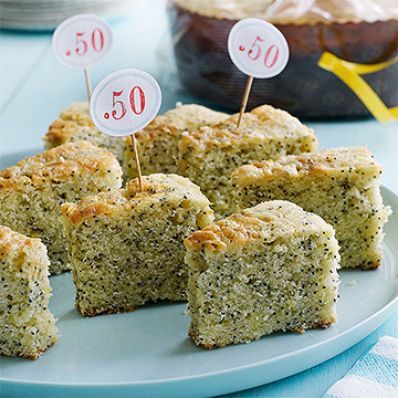 In a medium-size bowl, whisk together flour, baking powder, salt and poppy seeds. Set aside. 2 of 6 In a large bowl, beat butter and sugar until fluffy, 2 minutes. Add eggs, one at a time, until incorporated and mixture is smooth. Beat in vanilla. Add half the flour mixture, then the milk-lemon juice mixture. Beat on low speed until smooth. Add remaining flour mixture and beat until just blended. Stir in lemon peel. 3 of 6 Transfer batter to pan(s) and, at 350 degrees F, bake large tube pan for 65 minutes or small pans for 33 to 35 minutes, until top is dry and lightly browned. Cool cake(s) in pan on wire rack for 15 minutes, then remove large cake from pan (if using). Leave smaller cakes in their paper pans. Cool completely. 4 of 6 Slice large cake into 16 slices and package individually. Wrap smaller cakes in festive plastic wrap. 6 of 6 To order pans, visit thepeppermillinc.com, $10 for 12 pans, or bakedeco.com, $13.50 for a pack of 25.